Recently I was interviewed for a podcast on the Personality Disorders Awareness Network which took questions from listeners. 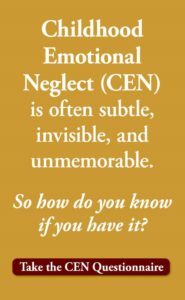 One of the questions was a request for names of other books about Childhood Emotional Neglect (besides my books, Running on Empty: Overcome Your Childhood Emotional Neglect and Running On Empty No More: Transform Your Relationships With Your Partner, Your Parents & Your Children). Although Running on Empty (2012) and Running On Empty No More (2018) are the first and only books specifically about CEN, there are a number of other books which talk about important aspects of CEN in a very helpful way. Here is a list of a few of the self-help books in my waiting room, and the particular aspects of CEN that are addressed by each. I hope you find them helpful. Self-Esteem by McKay & Fanning: I recommend this book for two adult CEN struggles. The first is Unrealistic Self-Appraisal (page 80 of Running on Empty). If you have difficulty identifying your own strengths and weaknesses or your own personal preferences and personality traits as is often a problem for people with CEN, there is an exercise in this book which addresses it directly. Secondly, if your unrealistic self-appraisal is skewed in the negative direction, that is the definition of low self-esteem. This book offers education, explanation, understanding and thought-provoking approaches to increasing your self-esteem and self-confidence. 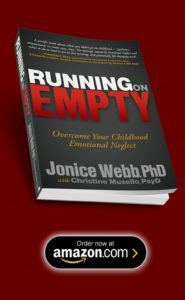 If You Had Controlling Parents by Dan Neuharth, PhD, Stop Walking on Eggshells, by Paul Mason and Randi Kreger, and Children of the Self-Absorbed by Nina Brown, EdD are very helpful if your CEN is a product of parents who fall into the following Parent Types (page 14 of Running on Empty): Narcissistic, Authoritarian, Addicted, Achievement/Perfection or Sociopathic. In these two books, you will learn more about how your parents affected you, how to set boundaries with them as an adult, and more. I Don’t Want to Talk About It by Terrence Real. 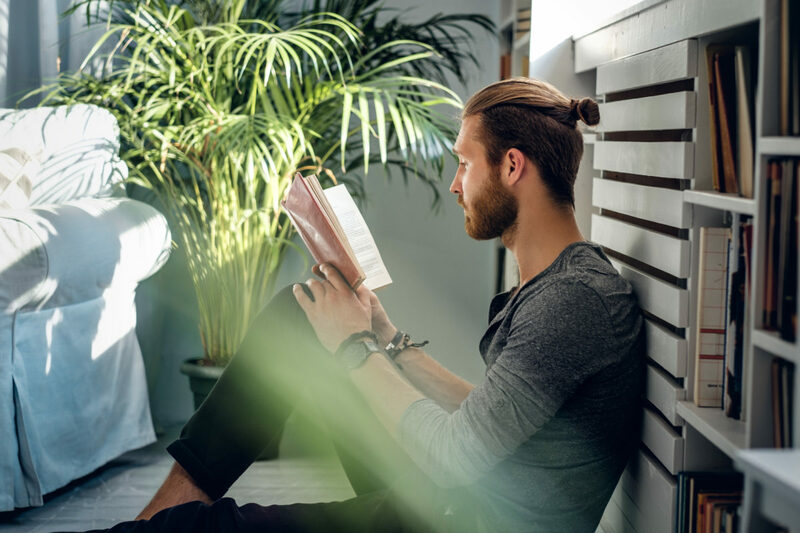 If you are a man or have a man in your life who struggles with emotional awareness, expression, and connection, often a result of CEN, this book is a compassionate and enriching view of what that struggle is like and how to get out of it. Emotional Intelligence and Social Intelligence by Daniel Goleman. 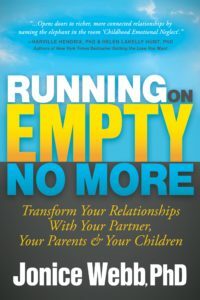 These books are about one of the most primary struggles of the CEN person: alexithymia (p. 98 of Running on Empty), as well as the purpose and usefulness of emotion (p. 120 of Running on Empty). Both books are very readable and interesting and will educate you on the most important principles of emotion: how it works, what it does, and how important it is to understand and navigate the world of feelings. Your Perfect Right by Alberti & Emmons. This book is essentially a course in how to improve a number of struggles outlined in the Self-Care section of Running on Empty (p. 138 of Running on Empty). Like saying “no,” asking for help, and speaking up for yourself in general. I will update this list as I discover more books. If you have found a particular book helpful, please post it in the Comments Section of this blog, and I will add it to the list. I have studied these books “Emotional Intelligence” and “Social Intelligence” by Daniel Goleman. I learned nothing. I think they are academic books, not clinical books. I`m literally blown away by the type of knowledge that you have! Despite having been to umpteen Psychotherapists since high school I never even thought of such a topic. I imagine this applies to some women as well . I`ve already copied and pasted this to some of my friends. This is something my past therapists and twelve step groups never thought of let alone myself. Besides none of the self help books I have at home covered this either. Thank you so much for the above list of reading recommendations. As a survivor of childhood emotional neglect and a thriver in recovery, I am always looking for books to enrich my life and the work I do. Giving back to others who are really hurting from CEN. If I can say or do one thing that makes a lasting change in another person’s life, including my own 4 adult kids…I am living my life’s purpose.